Ever since AMD launched their Epyc line of workstation and server CPUs, Intel has been feeling the heat in the high-performance chip market. They launched the Xeon Scalable Processor line as part of the Skylake-SP architecture but that was directed solely at data center users. This, along with confusion due to a new naming convention, has made workstation users feel left out. Today, the chipmaker announced its new Xeon-W line of CPUs which aims to bridge the gap between consumer and server processors. 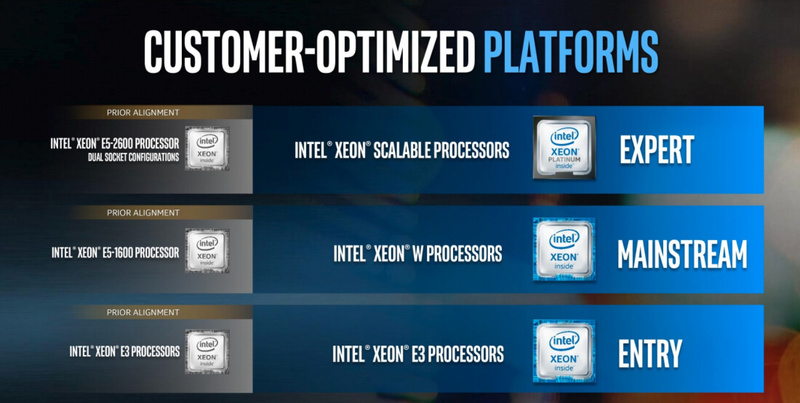 This means Skylake-SP Xeons are coming to LGA 2066. Previously, Intel's three-tier approach to workstation and server hardware consisted of the Xeon E3 line on the bottom, the Xeon E5-1600 in the middle and the Xeon E5-2600 line at the top. 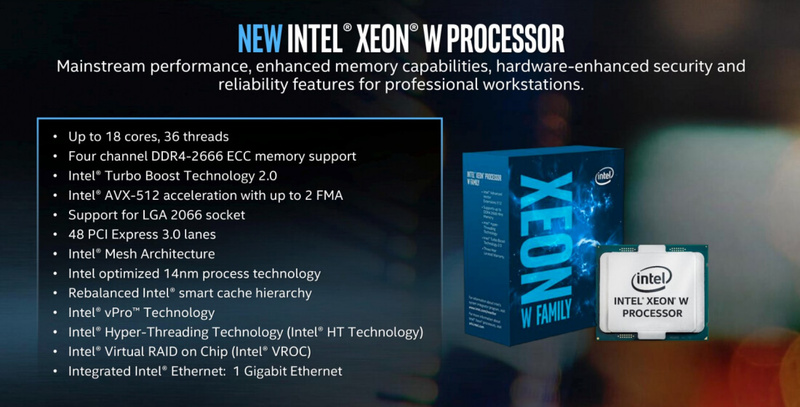 The Xeon-W announced today will replace the mid-tier Xeon E6-1600 while the Xeon Scalable Processors have replaced the E5-2600. Historically, the upper two tiers were very similar and shared the same socket. With Skylake-SP moving up to the LGA 3647 socket (but the others staying at LGA 2066), a feature gap between consumer and enterprise was formed. Intel is launching Xeon-W today to close that gap. So what new features are coming with this launch? An easy way to describe it is creating Xeon versions of the Skylake-X (Core i9) family. Professional features like vPro, AMT and extended memory support are all integrated now. Although it shares the same LGA 2066 socket as the X299 consumer boards, Xeon-W likely will not be compatible. Instead, you will need a C422-compatible motherboard to run one. 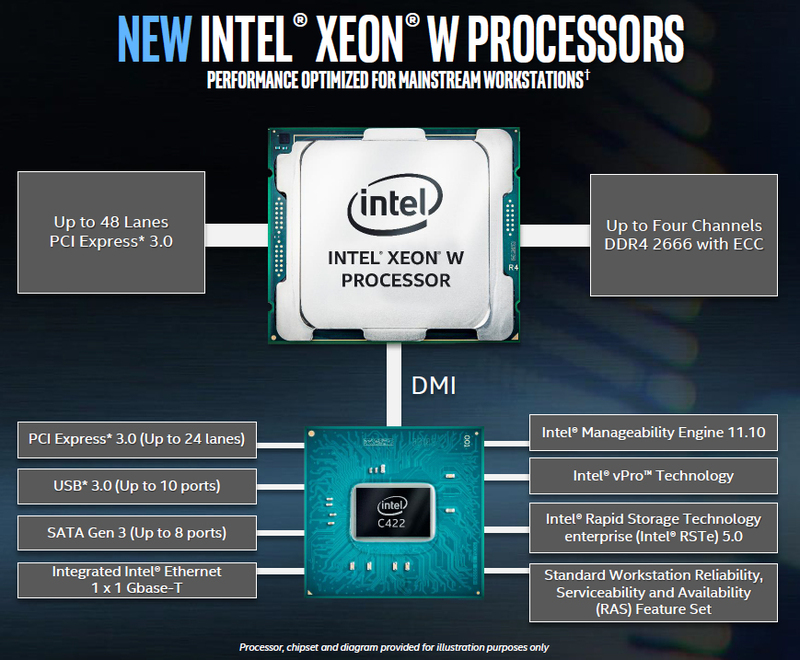 Xeon-W will have support for up to 18 cores / 36 threads, 48 PCIe lanes and 512GB of DDR4 RAM. Intel is launching eight different SKUs with pricing starting at $294 for 8.25MB of L3 cache. We don't know the exact pricing for the highest two SKUs but expect something in the neighborhood of $2,000 to $2,500. The top six CPUs will have a TDP of 140W while the bottom two will run at 120W. Until benchmarks start to show up, we can only speculate on Xeon-W's performance against AMD's Ryzen and Epyc lines. AMD appears to have the edge in terms of core count and PCIe lanes but Intel claims better single-threaded performance and higher clock speeds. More information about the top two SKUs will be released in Q4. Was trying to read the comments via the website but I wasn't able too? Xeon-w okay seems like intel really likes re-segmenting their product lines a little to often for my tastes. I understand the consumer and enterprise segmentation for the dual socket solutions but alot of the segmentation is geared at driving up cost for the consumer like the x299 socket doesn't allow adopters to pick a cheaper way in like in the past you could use 1150/1151 boards and didn't need separate chipset for xeon unless you needed ECC support which something intel doesn't give consumers class without paying enterprise prices I'm almost certain those features are purposely disabled like those of us that want to run high purpose databases and want ecc or use it as an authentication services through multiple vpn layers..
wiyosaya and Reehahs like this. There were no other comments until yours. Yours was the first. Another salvo in this battle. The war goes on. It is awesome to have the competition again, but I wonder how much Intel thinks they can charge for this. I would also love to see benchmarks, too. Given the minimal change in performance in the last 2-3 generations of Intel chips, I have to assume they have been holding back better stuff in anticipation of AMD's latest offerings. I could be wrong, but I think you will see the next gen Intel stuff overpower AMD again. I love the competition Makes everything better for us little folk.